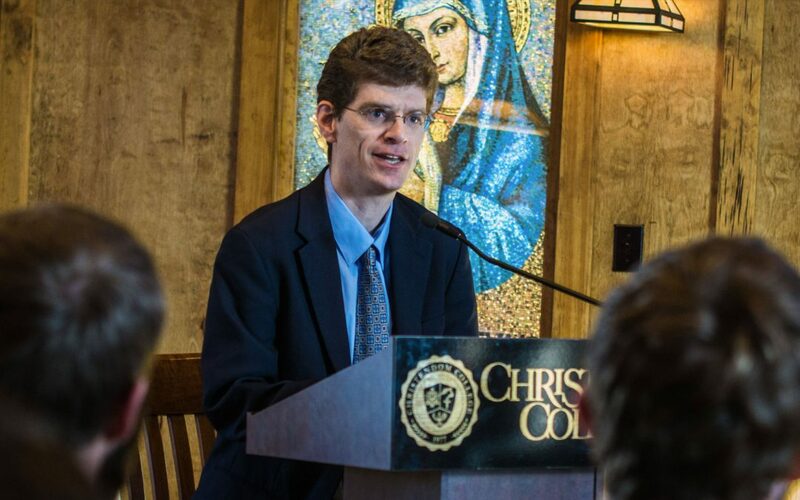 Theology chair for the University of Saint Mary of the Lake Dr. Matthew Levering presented the annual St. Thomas Aquinas Lecture at Christendom College this past week to a packed room of students, faculty, and staff members. Held every year on or around the feast of St. Thomas Aquinas, Levering delivered a lecture entitled “Aquinas on Studiousness,” explaining how studiousness is significant for the Christian moral life. Levering, who is the author of numerous books, spoke on studiousness in a nuanced manner, examining the topic through the lens of Paul J. Griffiths’ work Intellectual Appetite and through the thought of St. Thomas Aquinas. Levering touched upon the differences between studiousness and curiosity, stating that the studious do not seek to dominate what they hope to know, but look to respond lovingly to knowledge as a gift. The curious, on the other hand, look at reality as something to be seized or dominated.